Tommee Tippee was one of the main brands I heard about when pregnant, and I ended up going on to purchase their bottles for feeding Jack. As I have stated before weaning has been a very exciting and enjoyable experience for us. However, Jack is now getting older so it's time for him to start feeding himself and using a plate. I have preciously given Jack a plate which he has just pushed off his highchair. 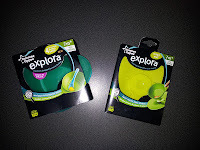 Therefore, the lovely people at Tommee Tippee sent me some of the Explora range to try out with Jack. Tommee Tippee is known around the world for their baby products. They have a variety of ranges including Closer to Nature, Explora, Essentials, Sangenic and Tip It Up. For the purpose of this review we shall be focussing on Explora. 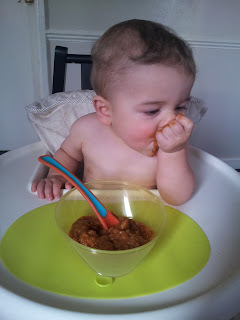 Explora is a range that has been created for when weaning begins, and is designed to help make feeding your baby easier. I was sent a Magic Mat and Easy Scoop Feeding Bowls for this review to help with getting Jack to keep his plate/bowl on his highchair. The Magic Mat is a small mat which sticks to the surface and then has a small sucker in which the plate or bowl will stick too. I was a bit apprehensive as to if this would work or not; how could a little mat stick to a surface and keep a bowl in place. However; the mat stuck really well to Jack's high chair tray and the bowl stuck really well to the mat. The mat is really good for using when going out as it can be rolled up and taken with you and also easy to store. The mat comes in four different colours and sticks to all flat surfaces. It is also BPA free. The Easy Scoop Feeding Bowls are also very good, they are a good size. The bowls are really easy to use, and simple to scoop food out of. They have a small handle which you can hold onto and a curved triangular base which makes it easy to get the food. The bowl sticks really well to the mat. 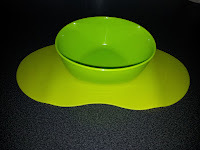 These bowls come in a handy four pack and are available in two colours. Again they are BPA free and are safe within the dishwasher, microwave or freezer. Before using these products I first testing myself to see if I could pull the bowl from off the suction mat and I had to use a bit of force to get it off without pressing the release sucker. We used the 'Magic Mat' and bowls at each meal time for just over a week, and still are now and have only ever had it fail on us once. I believe this was due to Jack throwing a tantrum and gaing a bit of strength to pull it off, luckily with no food in. (Maybe this was why!?!) However, I believe the Magic Mat and Bowls to work extremely well. The Magic Mat retails at £4.99 and the bowls also retail at £4.99 and are available from the Tommee Tippee website or stores nationwide. Please Note. These products were sent to me from Tommee Tippee for the purpose of this review, all opinions and wording are my own.